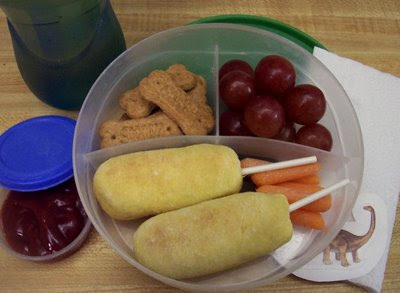 I wanted to make a special lunch for The Kid's first day back at school. (My baby's starting Kindergarten! I'm still nervous after two years of PreSchool.) I looked in the fridge for inspiration and saw some leftover turkey sausage from the calzones I made for our big birthday party. Since I still have lollypop sticks from the Daring Bakers Cheesecake Pop challenge, I decided to try to make some mini corn dogs by adapting a biscuit recipe I've been playing around with. They turned out well enough that I packed a little container of ketchup for dipping and couldn't resist putting in some graham cracker doggy biscuits along with baby carrots and huge grapes. (I really don't pack grapes in all of The Kid's lunches, even though all the ones I've posted have had them!) The bottle contains half apple juice and half water and today's dinosaur sticker is an Apatosaurus. This lunchbox is my submission to Margo at Coffee and Vanilla's excellent monthly Wholesome Lunchbox round up. It's an inspirational event with ideas for what to pack from all over the world. I'm sorry to be a tease, but I'll be posting about the birthday party, calzones, corn puppy recipe, and biscuits all later! Update: I've posted the Corn Puppy recipe. I probably have said this before but I love your blog! Can you tell me what sort of tupperware/lunch container that is? I haven't run into those divided ones before. Thanks! Oh, I can't wait for the recipes. Round-up will be posted on 15th of Sept.
jennifer b, thanks, the container came from the dollar section at Target quite a while ago. The area rotates seasonally, so keep an eye out. maybelle's mom, my computer's back up, so I'll have them up soon. Corn puppies? Those look wonderful. Do share!